Apple today announced it will host its annual Worldwide Developers Conference in San Jose from June 3 through June 7 at the McEnery Convention Center. Now in its 30th year, Apple’s biggest event will bring together the world’s most innovative and creative developers. With more than 1.4 billion devices now running iOS, macOS, watchOS or tvOS, WWDC 2019 will give attendees insight into the future of these platforms and work alongside the Apple engineers behind the technologies and frameworks developers rely on. WWDC 2019 will deliver the latest Apple news from the keynote stage and celebrate the breakthrough work of developers who are creating new experiences in areas including machine learning, augmented reality, health and fitness, and more. This year’s program will feature technical sessions, hands-on labs and guest speakers to provide Apple’s existing developer community and the next generation of app developers with the knowledge and tools to help turn their next great idea into reality. WWDC brings together the world’s most creative minds to work together with Apple engineers and connect as a community. Developers can apply for tickets today through March 20 at 5 p.m. PDT through the WWDC website. Tickets are issued through a random selection process, and developers will be notified of their application status by March 21 at 5 p.m. PDT. Developers and Apple enthusiasts everywhere can live-stream the conference on the WWDC appfor iPhone, iPad and Apple TV as well as through the Apple Developer website. 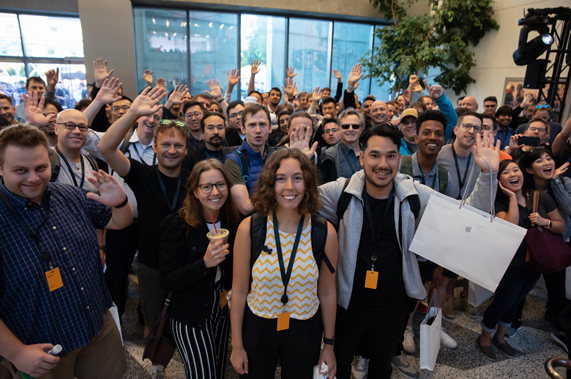 Students are an integral part of the Apple developer community, and last year WWDC saw attendance from student developers spanning 41 different countries. Up to 350 WWDC scholarships are available this year, providing students and members of all STEM organisations an opportunity to earn a free ticket and lodging for WWDC. Details on how to apply are now available on the WWDC website. Quadrupling the number of locations US customers can send their iPhone to be disassembled by Daisy, its recycling robot. Augmented Reality can serve many purposes: It can help you find your way easily or immerse yourself in Harry Potter's world. It's been two years since Android O introduced adaptive icons, and many apps and developers have yet to get with the program. There's a lot to like about the Nokia 9 PureView: it's got a unique camera setup, its construction feels high-end, and it's generally a solid performer.